The Blue Ridge Parkway melds wild, rustic and agricultural themes to create an overall aesthetic unique in the national parks. This is a 6-night, 7-day workshop. Your adventure begins at 10 a.m. on July 29 and ends after a final slideshow on the afternoon of August 4. $2,150 + applicable taxes. Apply below. Skill level: Skill level: Open to all who have an understanding of the basic principles of photography and of their cameras. Note: Deposit of $500 is required to reserve your spot at the workshop. Balance of $1,650 due on April 30, 2018. Or, you may choose the "Pay in full" ticket if you desire to pay all at once. Last day for a cancellation request is April 29 (see details here). The workshop fee does not include transportation to and from the park, lodging, food or the park admission fee. We are always searching for new places to explore and to offer our workshops. We may one day explore the Blue Ridge Parkway again, but we're likely to visit a lot more parks and places before then. If you have a dream of making epic long exposures here, we hope you join us in 2018. Take a road trip with National Parks at Night. And there may be no better place to do it than on one of America’s favorite roads, the Blue Ridge Parkway! The parkway a National Scenic Byway maintained by the National Park Service, and comprises 469 miles of infinite photo opportunities. Subjects include farmland, livestock, barns, 18th century cabins, stone churches, meadows, ponds, lakes, waterfalls, wildflowers, wildlife, rock formations, cascading mountain ranges and more—plus, of course, the parkway itself, perhaps the most famous byway in the U.S. And this workshop will be adding to that list: You can also shoot the stars, the Milky Way, and all the aforementioned subjects with light painting. For sure, this will be a light painting-intensive experience! 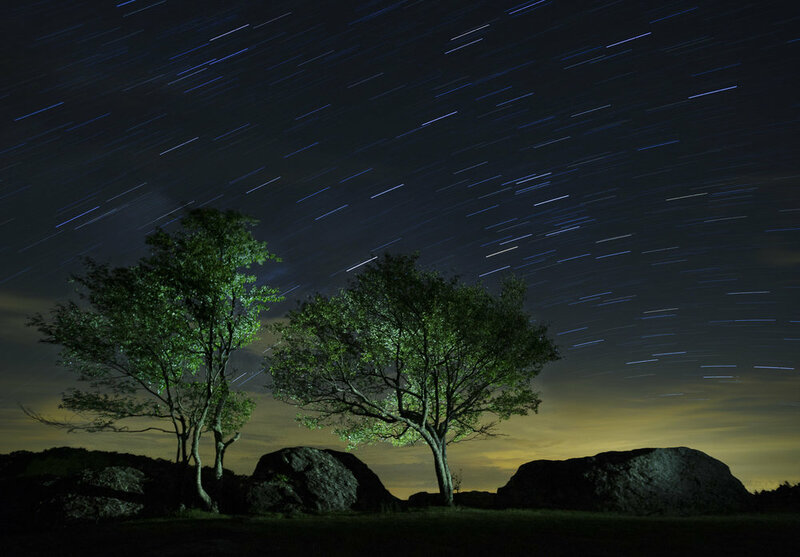 The workshop has been carefully scheduled to give participants opportunities to photograph on the Blue Ridge Parkway in various nighttime lighting conditions. The full moon will be rising early in the evening toward the beginning of the week, serving as fill for light painting various subjects, including historic structures, buck and rail fences lines, bridges, tunnels and more. As the week progresses and we move south into more mountainous scenery, the moon will be rising later and later, allowing the Milky Way to shine bright above the peaks and ridges cascading into the horizon. On travel days we encourage participants to drive the Blue Ridge Parkway to get from town to town. We will enjoy daytime outings along the way, which may include stops at a visitor center, a group lunch, etc. 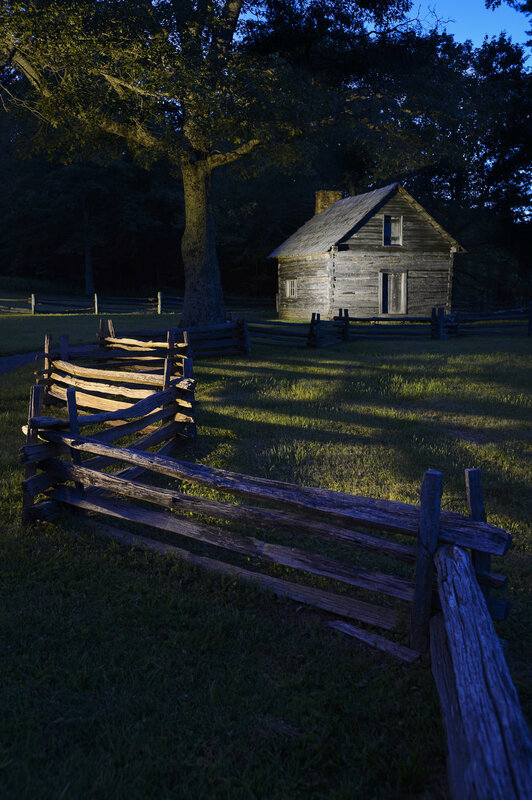 Perhaps most notable is that while in Roanoke we will visit the O. Winston Link Museum, which commemorates the work of this pioneer night photographer. The museum includes Link’s hand-crafted prints, displays of his equipment, demonstrations of how he lit his famous railroad scenes, and more. Our group will be given a private tour of the museum, potentially by a volunteer who actually worked with Link. 30-Jul Roanoke Field Outing / Road time! Photography! 31-Jul Mount Airy Class Photography! Aug. 1 Mount Airy Image Review / Road time! Photography! Aug. 2 Boone Field Outing / Road time! Photography! Aug. 3 Asheville Class Photography! Folks with extensive experience shooting at night will still find this class challenging, stimulating and inspiring. We can offer a portfolio review, specific challenges and goals, and will offer guidance in the field if you mainly want to concentrate on creating portfolio images or learning more advanced techniques. We hope to push you to step outside your comfort zone—to test the limits of what you and your camera can do. 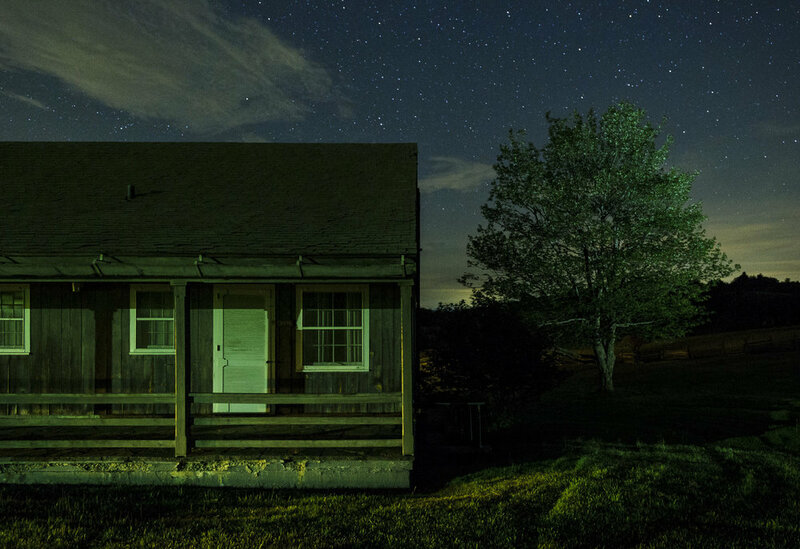 You’ll go home after the workshop with a solid grasp of working with different night photography techniques in different kinds of locations, ranging from natural landscapes to agricultural spaces to historic places. This workshop will have both field and classroom instruction. We will be in the classroom about every second day, and out in the field at different locations every night. Participants can stay out shooting as long as they, or their camera’s batteries, hold out. While in the field, the instructors will demonstrate their own techniques, and will work with participants one-on-one to make sure everyone gets the most out of the workshop. Because we will be traveling during much of the workshop (again, road trip! ), we will not have classroom sessions every day. During the classroom sessions we do have, there will be presentations by the instructors, but we will focus on developing your images and sharing everyone's work and ideas with each other. Each classroom session will also have a review of the previous night’s work. On travel days, we may have only an image review and will embark on a daytime field outing between hotel stops along the Blue Ridge Parkway. You are responsible for your airfare and car rental. (There is no need for four-wheel-drive or high-clearance vehicles.) If you are interested in sharing a car rental, let us know and we will try to connect you with someone in the group. We wholeheartedly encourage carpooling! Because we will be spending a few hours driving every couple of days, we highly recommend sharing rental cars for purposes of camaraderie. The workshop will begin in Roanoke, Virginia, and end in Asheville, North Carolina. You may want to book a three-way flight that arrives in the former and leaves from the latter, and book your rental car for the different drop-off location. If you do choose to fly into and out of Roanoke (or Asheville, for that matter), please be aware that the interstate highway route between the two is nearly 4 hours. Also, note that both of those airports are regional, so flight options are limited in terms of carriers and prices. Alternatively, you may prefer using larger airports that, while further away, offer more flights from more airlines. Greensboro International is a reasonable distance from both termini of the road trip, and could perhaps be the best option for booking a round-trip flight. Charlotte is perhaps second-best for the same strategy. The workshop will be based at a major hospitality chain that has hotels in the four towns along the route (Roanoke, Mount Airy, Boone, Asheville). We have arranged with this chain for workshop participants to make one phone call to reserve rooms at all four locations. You are not required to stay at the official workshop hotels, though doing so will be easier than finding and booking four hotels yourself, and makes it easier to meet with the group each morning. Booking info and a group code will be sent after registering. If you are interested in sharing a room with another participant, let us know and we will try to connect you with someone like-minded in the group. 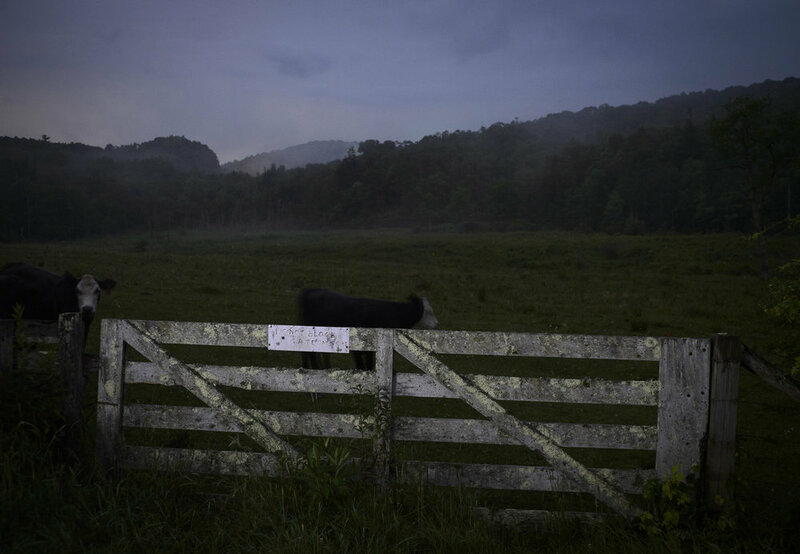 Summer in the mid-southern Appalachian Mountains can range from warm to hot, and occasionally dip into mild at night. Recommended attire: During daytime, you’ll probably want to dress in warm-weather clothing: shorts or light pants, short-sleeve shirts. You may be OK in the same attire at night, but prudence dictates bringing some long-sleeve shirts, a pair of jeans or hiking pants, and a light or medium-weight jacket. If you want to be really prepared, bring a light base layer too—odds are you won’t need it, but when we get into the mountains south of Asheville at night, ya never know. Though we won’t be trail hiking, we still recommend a good pair of trail shoes for comfort and stability. It’s also wise to bring rain gear, because if we encounter some weather, that only means the photo opportunities get even better, so you can be sure we’ll be out shooting! Demonstrations and image review will be conducted in Lightroom and Photoshop. No vigorous activity will be required, but please consider your physical abilities prior to registering. There will not be any long hikes (the longest would be a possible 3/4-mile walk on a dirt road), but you should be comfortable carrying your own equipment over uneven ground in the dark. I remember traveling the Blue Ridge Parkway as a kid, with my parents and my sister (my other two siblings weren’t born yet). My dad really talked the place up for me, and likely played John Denver’s “(Take Me Home) Country Roads” on the car’s 8-track player. 40 years later, whenever I’m on the parkway, that song still works its way into my head. I remember my mom being nervous as we drove atop some steep cliffs, and me wondering why. I don’t remember exactly what my little sister was doing, but I’m sure her behavior was annoying me. And vice versa. As happens in life, nearly two decades went by before I traveled the Blue Ridge Parkway again. At the end of college, my buddy and I drove part of the byway as part of a cross-country trip that was the basis of a book I wrote for my senior project. I remember that trip involved excellent BBQ and seeing a lot of cows. Despite these great memories from my childhood and early adulthood, I didn’t “fall in love” with the parkway as a photography destination until about five years ago. I had been in Raleigh, North Carolina, and needed to travel to Roanoke, Virginia. My schedule allowed a couple of days to meander in between, so I chose to drive the scenic route—perhaps the most famous scenic route in all of America. I veered onto the Blue Ridge Parkway in Asheville and started heading north. The drive took a long time. I couldn’t get more than a dozen or so miles behind me before needing to stop again, to step out of the car and enjoy the landscape—to gaze over views of distant mountains, to hike to waterfalls, to stroll among orchards, to learn about historic sites. And to photograph, photograph, photograph. The day didn’t have enough minutes, nor the night enough hours, to capture all the possibilities that the parkway presented. Later that year I visited Roanoke again, and on the return trip to my home in the northeast, I drove the stretch of Blue Ridge Parkway all the way to its end at Shenandoah National Park. The following spring I did the opposite, merging onto the parkway in Asheville and driving to its southern end at Great Smoky Mountains National Park. And since then I’ve explored both the overt and hidden gems of this amazing thoroughfare any chance I get—whether for a few days or a few hours, whatever block of time circumstance offers. In 2018, I look forward to sharing this beautiful, diverse, mesmerizing place with you. Let’s create some Blue Ridge Parkway memories together. Not to mention some awesome photography!